Speaking to the national convention of the American Legion in Cincinnati, Ohio on Wednesday, Clinton wooed the veterans’ organization with promises of better medical care and a stronger military, while pointing out that her vision of an America as “the global force for freedom, justice and human dignity” enjoyed support of senior military officials and even the leading Republican security experts. “The decisions we make and the actions we take – even the actions we don’t take – affect millions, even billions of lives,” Clinton said. When America fails to lead, that either leads to chaos, or leaves a vacuum that other countries rush in to fill, she added. 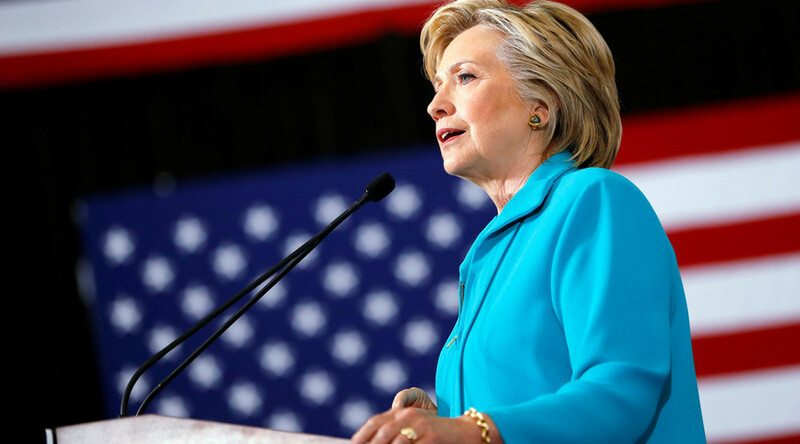 This belief in American exceptionalism should be above politics, Clinton told the American Legion, bringing up the recent letter by 50 Bush Administration officials criticizing the GOP nominee Donald Trump as reckless and dangerous. “They know I believe in a bipartisan foreign policy,” Clinton said, adding she was honored by their support. Hillary Clinton is giving a foreign policy speech right now that sounds like it was written by Genghis Khan. Reflecting this, the speech contained mixed messages about the US military, with Clinton proclaiming that the US “must always send troops in as a last resort, not a first choice… But we must be able to act decisively, alone if we need to.” The former is a strongly held belief of the Obama administration, the latter a key point of the George W. Bush presidency. Another example was Clinton’s condemnation of the cap on government spending that went into effect in 2013. Prominent Republican Senator John McCain has led the calls for getting rid of the sequestration and beefing up the military budget. Clinton also argued the US must take the lead in outer space and cyberspace, citing recent reports in US media accusing Russia and China of breaching a number of US private and government computer systems, including the Democratic National Committee and several state election boards. None of those claims have been substantiated by any evidence. Still, Clinton argued that the US should treat cyber-attacks like any other act of aggression, and respond accordingly. Hillary’s speech about American exceptionalism is now about mental health care for veterans. She then pivoted to the issue of veterans and their medical care, promising not to let anyone privatize the Veterans Administration and vowing to “build a 21st century VA that delivers world-class care” instead. Trump is expected to address Clinton’s criticism during his scheduled appearance at the Legion convention on Thursday.